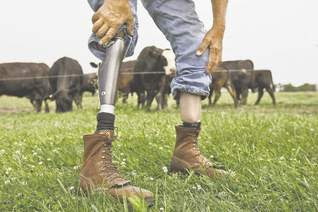 John Carlson in the Des Moines Register profiles local farmer and Vietnam War vet, Richard Gray, who says he's benefiting from the new prosthetics that now exist. The article says, "forty years ago, he got around slowly, his prosthetic limbs little more than bulky chunks of wood. The pain was intense and frequent in those days, the slightest misstep sending him sprawling. Today, it's carbon fiber and microprocessors, the prosthetic devices startlingly close to the real thing." Gray, pictured above, now wears "a silver prosthetic, known as a C-Leg, which has microprocessors in it that sense movement and adjust hydraulics, stabilizing the knee."